Here are more than 23+ great Tokyo breakfast brunch spots. Looking for a good spot for Tokyo breakfast or brunch on the weekend? I love breakfast! I am a very earlier riser, so breakfast is my main meal of the day. There are many other Tokyo Breakfast Brunch spots, but if I had to wait in line more than 30 mins I skipped. I will add more over time. Some of the restaurants below have multiple locations in Tokyo. If you have any recommendation, not listed, please make a comment below. Trunk Kitchen located in the Trunk Hotel in Shibuya is a great place to have early breakfast and lazy brunch. Trunk Kitchen, Jinguemae- Modern Hip Tokyo Breakfast & Brunch. If you can stay a the Trunk Hotel I would recommend due to the excellent service and impeccably appointed boutique rooms. However, at least enjoy a meal. The breakfast service is a la carte, and the brunch is a course menu. Expect to spend about 3,500 JPY per dinner. Reservations recommended. 2. Sawamura (Hiroo & Minami Azabu) – Sawamura has two locations in Tokyo that offer a very nice breakfast menu from 7:00-10:00 daily. Sawamura is one of my favourites since it opens early. Great if you are up early with jet lag. They have a wide selection of bread and make a tasty coffee latte to go or stay. The breakfast entrée menu is limited, but I have never had a problem finding something that hits my cravings. Most of the breakfast entries, be it an omelet or french toast set, are between 1,200-1,500 yen. Besides the food, the big sell point at Sawamura is the opening time of 7:00! Also at that time there is no line and has very good street parking right in front. If you arrive at 9:00, expect to wait on the weekends. Sawamura, originally from Karuizawa, also has a store in Marunouchi. Great Tokyo Breakfast Brunch option for early risers. 3. Crossroad Bakery (Ebisu) – It checks all the boxes – open early, free croissants and buns, breakfast all day and good coffee… also very child-friendly. You can enjoy an onsite freshly baked muffin, order a meal or both. Super close to Ebisu station and Daikanyama, and Ebisu Playground Park – location easy for walkers or bikers. Our favorite was the French Toast and Egg Muffin. Here is the Breakfast menu. For under 1,000 yen one can enjoy a filling meal. The coffee and mocha latte is also very delicious. The entire restaurant is very child and stroller friendly, so bring the entire family. They also sell half and full loves of their wonderful breads and have a selection of pies that can be ordered for takeout or eat in. 4. Le Pain Quotidien (Shibakoen) is a unique breakfast spot in Tokyo since it opens early (7:30) and is nestled between cultural and sonic spots such as Shiba Park, Zojoji, Tokyo Tower, Daimon, and Hamarikyu. A great spot to enjoy an early breakfast or brunch before you set out for a fun day. Le Pain Quotidien, which originated in Brussels and translates to “The Daily Bread, ” does have made on the premises amazing bread. However, they also offer a diverse breakfast menu with eggs, yogurt, and cheeses. My kids favorite part of eating at Le Pain Quotidien is the chocolate and nut spreads that you can serve yourself and apply to your bread. Here is the updated English menu to wet your appetite. Le Pain Quotidien Menue in English. about 2,000 yen per adult with food and drinks for breakfast. The store opens early and offers a large covered patio far enough from curb side that it is child-friendly. However, only drinks and bread purchased in the bakery can be eaten outside. Restaurant orders must be eaten in the sitting area which is very rustic with wooden tables, views of the kitchen and green views from the large windows in the back. Access: 1 min walk from Onarimon Station (Exit A1) on the Mita Line, or 2 min walk from Shibakoen Station (Exit A1) on the Mita or Oedo Lines. 5. 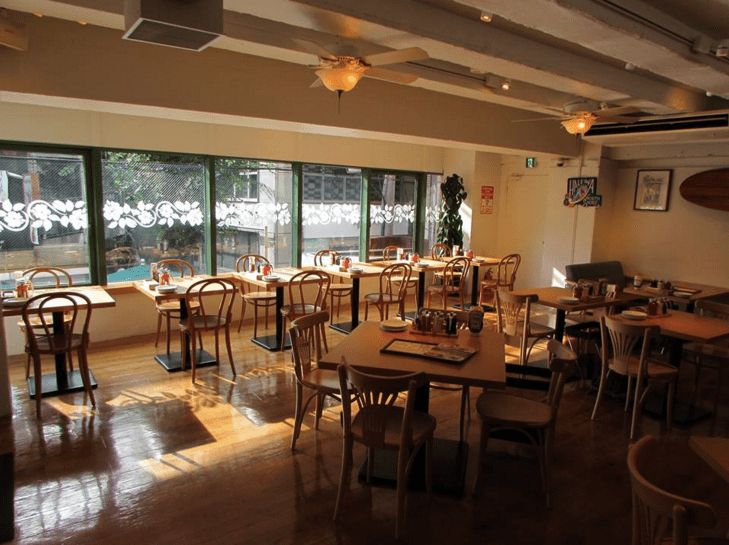 Good Morning Cafe (Sendagaya) – Opens every day at 7:00 and offers great breakfast options for the best price in Tokyo. If you are staying in the Shibuya or Shinjuku area it easy to get to; located right next to the Tokyo Metropolitan Gymnasium. Enjoy breakfast and then walk 8-10 mins to Shinjuku Gyoen National Garden for a wonderful morning adventure. Good Morning Cafe Sendagaya is a super baby and family-friendly restaurant with soft sofas, baby chairs, and a baby changing & nursing room. The breakfast menu is simple with eight meals offered: Acai bowl, French toast, Scrambled eggs, Fried eggs, Morning burger (great for jet lag), Ham Panini, Veggie bowl and toast set. Our two favorites are the scrambled egg set which includes toast and yogurt on the side for 630 JPY, and the perfectly toasted crispy french toast with light syrup and fresh cream on the side sprinkled with cinnamon for 750 yen. Access: 3 min walk from the Sendagaya station on the JR Sobu line or Kunitachikyōgijō Station on the Oedo Line. Note: Very baby and children friendly – baby chairs, baby changing and nursing area and stroller space. 6. 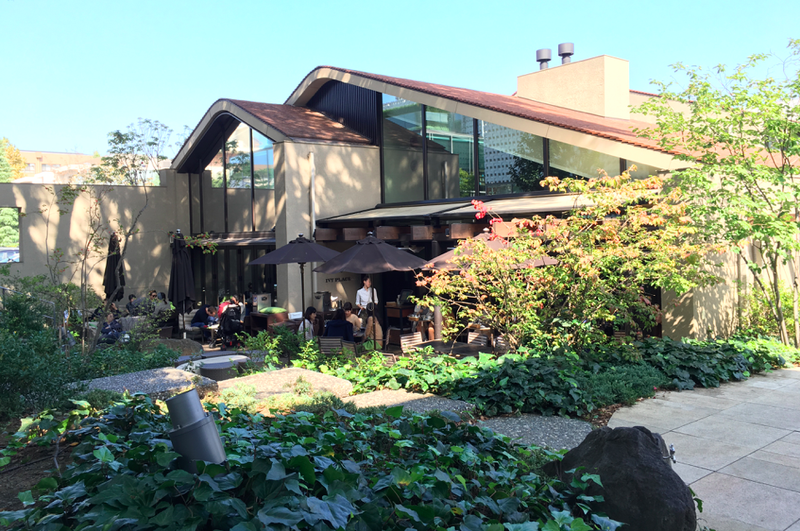 Bubby’s (Roppongi/Akasaka) – Bubby’s in Akasaka is a great spot. They also have three other locations in Tokyo (info on link below). Surprised that at 9:00 on a weekday there were only a few people. I liked the outside seating, although you can clearly hear the highway behind the building. Bubby’s is on the second floor of the Ark Hills complex and has a large courtyard so kids can be outside for a bit while you enjoy your coffee. I would also highly recommend Bubby’s for people staying at the ANA Hotel vs. breakfast in the hotel. I ordered the grill plate breakfast and was quite satisfied with it. 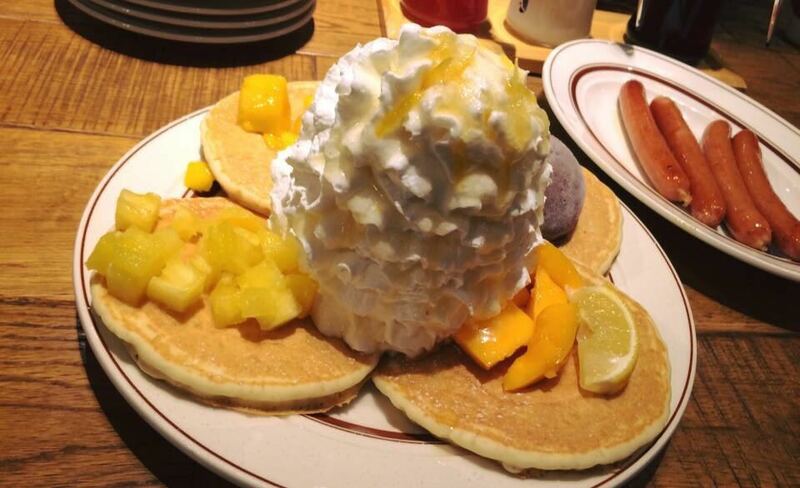 The 1,400 yen grilled meal includes a large pancake, a pile of hash browns, two scrambled eggs, a large slice of bacon, and some pineapple and grapefruit. Nice touch was the small dish of strawberry jelly (very tasty) and the Canadian maple syrup. Overall I would rank Bubby’s a B+. The eggs, although small compared to Clinton Street or Bill’s, were well complimented by the delicious pancake. The bacon was crispy with a bit of fat on the side. The hash browns were the best I have had in Tokyo but a bit too much. The pineapple and grapefruit slices were a refreshing end. Will I come again? Yes, with all four kids in tow. Enjoy your Tokyo breakfast brunch! 7. Eggcellent (Roppongi) – If you like eggs and wake up early than Eggcellent is an excellent option in Roppongi Hills. I visited Eggcellent for a late lunch. The specialty of Eggcellent is their Eggs Benedict. The entrance way is adorable; sculpted as an egg shell with the floor tiled to look like a yolk. Seating inside is spacious and was full at 14:00 on a weekday. The customers were all women with babies and small children. Looking around it was clear the favourites dish was Eggs Benedict and Tex-Mex. My single egg Benedict was cooked perfectly with a side of potato salad and lettuce for 700 yen. However, my bacon was a bit too thick and the English muffin was under toasted. The double egg Benedict was 1,300 yen. I also had a very well-made latte that was piping hot (although it was a 600 yen latte!). A unique feature of the restaurant is that there is counter space with electrical sockets if people want to eat and charge their phones or PC. There is outside sitting area which is protected from the rain. Another big plus is that it is open on weekdays from 7:00 and weekends 8:00 for the jet lag crowd. I must have driven by Eggcellent many times since it is located smack dab under Mori Building in Roppongi Hills where the cars, busses and cabs pass through. Glad I stopped in the eggs were great. Eggcellent is hidden a bit in a corner, so the best way to find it is to go downstairs from the Hollywood Beauty School or find the Armani Juniors store located right next to it. Will I come again? Yes, I think it is s a great spot to invite some mums and babies. If you are looking for a dog and baby friendly breakfast spot, Jade 5 is the answer. They serve breakfast all day and have takeout! Jade 5 is very small so you may need to wait in the a.m. but there is a small park right in front to sit and relax in until they call you. The menu is very broad from eggs Benedict to French toast and pancakes. I had the eggs Benedict on my first visit. The eggs were prepared very well and complemented the good size ham. However, the biscuit was a bit hard. On our second visit my son ordered the same and the biscuit was light and fluffy, however, had a bit too much maple syrup on the biscuit. I had the Jade 5 Jack & Jill breakfast that consisted of French toast, eggs, a sausage patty and Jade 5’s signature mash potato patty. Perfect amount of food for a Saturday a.m. brunch. Baby and I loved the soft french bread used for the toast. Hubby had the Popeye omelette that he ate very quickly. Breakfast for a family of four with drinks will cost about 4,000 yen for a nice breakfast. Hunter, our English Springer Spaniel, was also very happy to join us and rest at our feed eating Baby’s droppings. Jade 5 is a nice little breakfast joint where you will find something to suit everyone’s taste buds. Enjoy. Lauderdale’s is a very casual environment both inside and outside which makes it the perfect family breakfast spot. There is no wait on weekdays and only a short wait on weekends. The menu has pancakes, omelets, yogurt and fruit. The most popular dish is the Mama’s Omelette, which I ordered. The omelet was a light green, from the vegetables pureed in the eggs, with the perfect amount of cheese. Their bacon is also nice and crispy. I find Lauderdale’s to be one of the most economical and relaxing breakfast locals in Tokyo. Great place if you are in the Roppongi area or staying at the Grand Hyatt. 10. 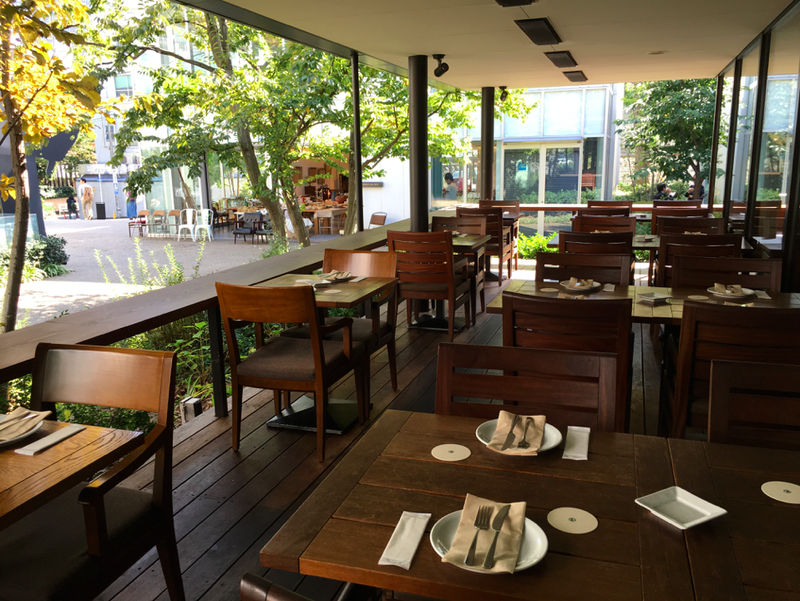 Bill’s (Harajuku/Omotesando) – Bill’s in Harajuku/Omotesando has the bestambiancee of any breakfast place if you can get a seat on the veranda area. If you are a group of over three people, expect to wait for at last 30 mins. The food was delicious. However, I think overpriced compared to Lauderdale’s or Bubby’s. The menu is definitely the most diverse vs. others establishments mentioned on this page, with the exception of the French Kitchen buffet. I had the grilled meal, and it was extremely filling. There must have been 3-4 eggs in the scramble, and the slices of bacon were extremely thick and fatty. The orange juice was the best juice I think I have had in Tokyo. Bill’s has branches in Shichirigahama, Yokohama and Odaiba. 11. 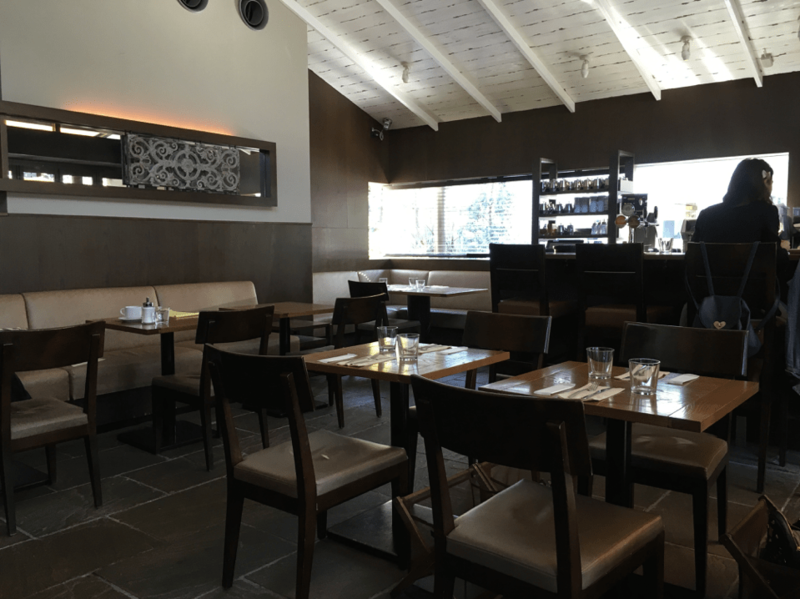 French Kitchen (Roppongi) – The French Kitchen located in the Grand Hyatt in Roppongi Hills is my go to for special girlfriend brunches. If you want a place for a 1-2 hour leisurely break and brunch, this is the place. The food is fantastic and the restaurant spacious and comfortable. The breakfast buffet for 3,550 yen covers all Japanese and western breakfast and brunch items. The price is great considering the selection of menu and also unlimited coffee and juices. My favourite is the made to order omelettes and great cheese selection. Kid/child-friendly, but I find it much more relaxing and special without them:-). Definitely my favourite Tokyo Breakfast Brunch location. 12. 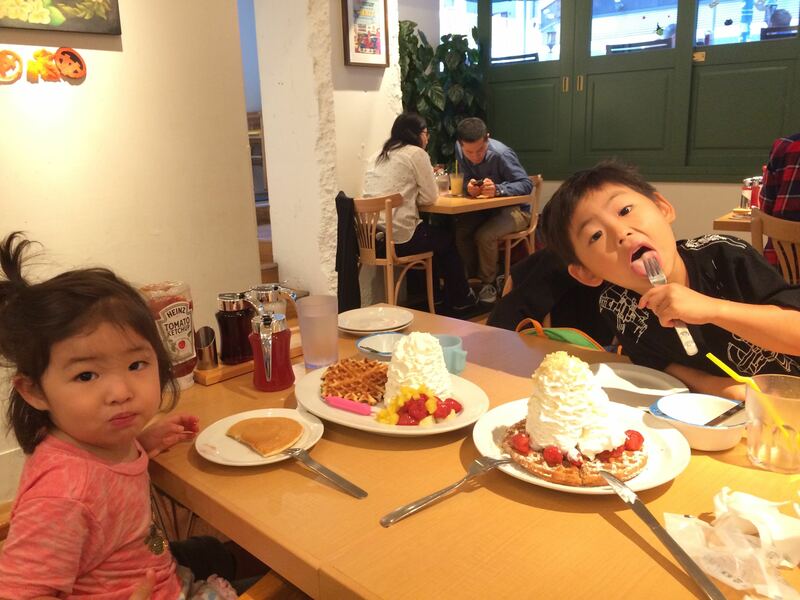 Ivy Place (Daikanyama) -Ivy place is our favorite child-friendly spot to have breakfast on the weekend. Located in the stylish Daikanyama T-Site complex, Ivy Place opens daily from 7:00 a.m. and offers a variety of breakfast choices that change with the season. Patrons have the choice of indoor or outdoor seating. Indoors is spacious and lovely; outdoors you have an upclose view of greenery. Their garden terrace is popular and crowded on nice weather days. 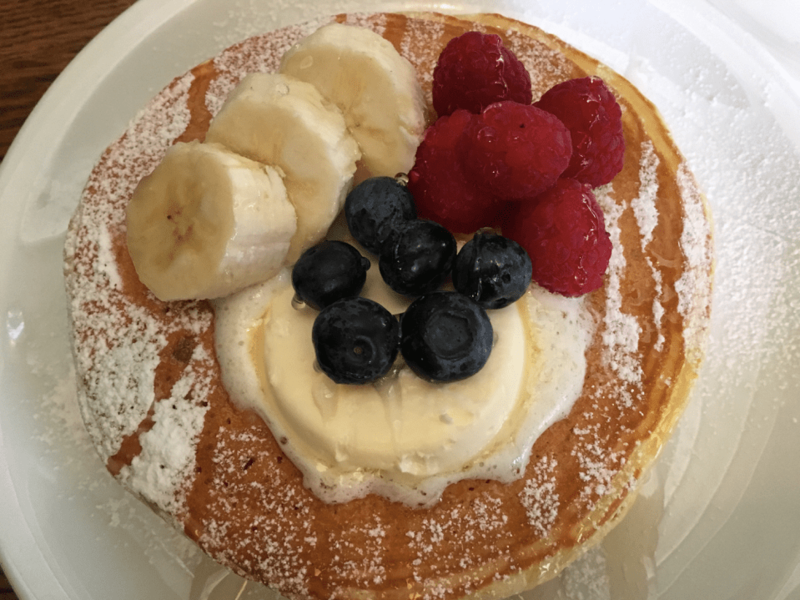 We usually order the popular classic buttermilk pancakes served with butter and your choice of maple syrup or honey (1300 yen) with additional fruit toppings (350 yen) and a coffee (300 yen with breakfast) with unlimited refills – rare in Tokyo. The pancakes are very good and generously portioned, and the free coffee refills are appreciated. The flatbread Pizza (1200 yen) and seasonal smoothies (850 yen) are family favorites. Ivy Place doesn`t take reservations for breakfast so get their early on the weekend! The place fills up fast. If crowded the staff will take your name and number and call you when the next table is available. After of having a leisurely breakfast at Ivy Place we love browsing the stores in the leafy T-site complex; the Bornelund Toy store, the Tsutaya Book store; the Motovelo bike store to test out the new battery-powered assisted bicycles; and more. – High-chair and tableware for children available. – Diaper changing station and nursing room can be found in the T-Site complex. – T-site parking is next door. Discounted rates for orders over 2,000 yen 1 hour free parking. Orders over 5,000 yen 2 hours free parking. 13. Eggs n Things (Harajuku, Odaiba and Ginza) – Eggs n Things offers a variety of breakfast items from 8:00 – 22:30 on weekends and from 9:00 during the week. Light and fluffy pancakes, waffles and crepes with your choice of toppings; omelets, meat & eggs, fruit cups and mouth-watering specials like the Hawaiin loco moco or Eggs Benedict with Canadian Bacon. My kids love their pancakes with their overly generous toppings of whipped cream and fruit, and their 100% fruit juices. 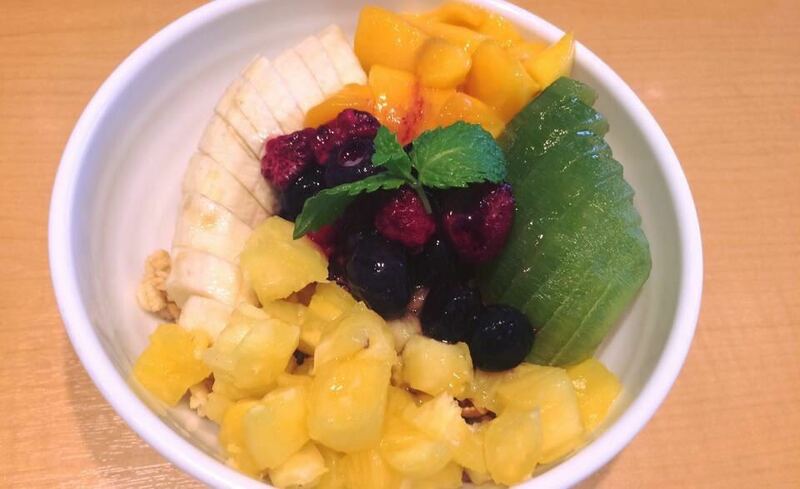 Eggs n Things has over 10 locations in Japan, three in Tokyo, serving breakfast all day everyday. Their restaurants are bright and spacious and their terrace dining is pet-friendly. 14. 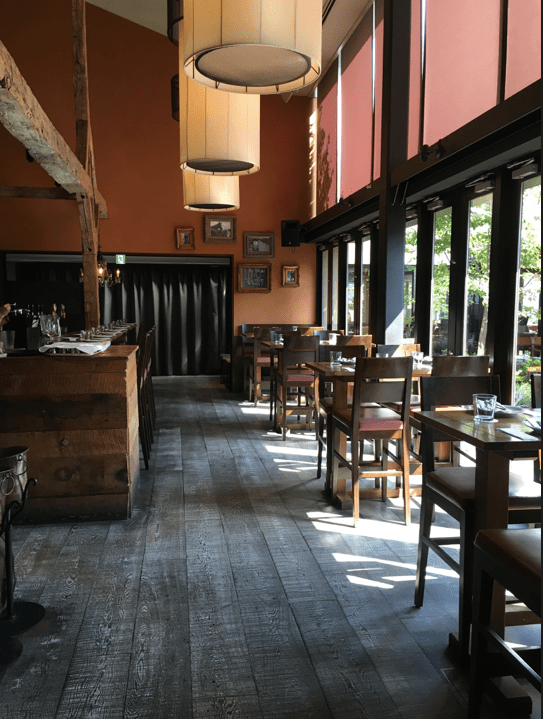 Soul Food House @ 148 (Azabu Juban) – Only open for brunch on Sunday’s from 11:00 -15:000, but so good I have to add to the list! Soul Food House @ 148 (official name) offers an awesome Tokyo breakfast brunch on Sundays, lunch and dinner (Wed-Sat) (with the food that all Southerners grew up with – fried chicken, waffles, BBQ pulled pork, gumbo, biscuits, catfish, chitlins and greens. This food is authentic and brought to you from the owners and cooks LaTonya and David Whitaker from Mississippi and Georgia and are doing a great job bring that at home feel to Tokyo. My favorite meal of the day is breakfast, so we visited for the brunch as soon as they opened on Sunday morn’. My teen opted for the waffles and fried chicken plate (1,480 yen), Baby and I had a fried egg slide and hashbrowns (980 yen ) and a side dish of biscuits and gravy (780 yen). The waffle were light and fluffy which compliment the crispy fried chicken – maple syrup served on the side so you can adjust the sweetness. My egg slider and hashbrowns were the perfect amount for me and absolutely wonderful. Biscuits are my favorite so saved those for last, and they were a treat melting in our mouths with the gravy. An awesome brunch! Access: 3 min walk from Azabu Juban Station on the Oedo and Namboku Lines. Located directly across from the Blue and White Shop and the Peacock Super. 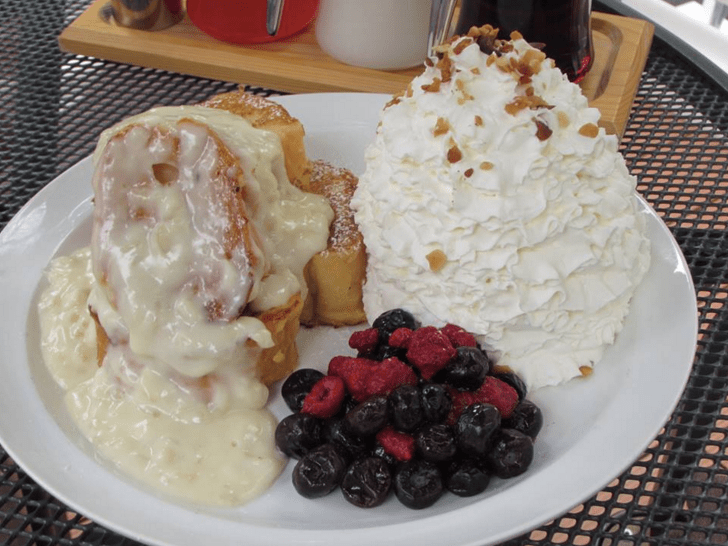 If you`re looking for another delicious and hearty American style breakfast spot open from 8:00 Clinton St. Baking Company is the place. Their breakfast menu is filled with a variety of dishes from hearty Pancakes, the star of their breakfast menu, Brioche French Toast, Huevos Rancheros, Spanish Scramble, a variety of Eggs Benedict (chorizo, soft shell crab, cod cake, etc) waffles and omelettes. They also have a number of soup, salad, sandwich and taco dishes for those looking for other options. We had the Smoked Salmon Potato Pancakes (1800 yen), Buttermilk Biscuit Sandwichwith Bacon (1300 yen) and the Maple Pancakes with Whipped Cream (1600 yen). The potato pancakes were deliciously crunchy on the outside, the caramelised bacon devine and the pancakes fluffy and tasty. and sausage, hot cakes and waffles but they offer many of these items gluten free! muffin. They also make a very smooth coffee latte. Breakfast items are between 1,000 – 2,000 yen. They also offer a separate lunch menu, a luxurious looking afternoon tea, and dinner. If you like your PIMMs, Fish Cakes, Shepard’s Pie, English Stew and other British dishes then thi is a good spot to frequent. Check out their menu here. The little brown circles to the left of the item denote gluten free. Note: Child highchairs available, Dogs may join if sitting outside. We love brunch so when we heard about one of the hottest brunch spots in Los Angeles opening in Tokyo we had to check it out. Hidden a 1-min walk from Daikanyama Station sits the cozy and spacious Blu Jam Cafe. Blu Jam Cafe serves a tasty selection of European-infused Vegan, Gluten-Free and Vegetable dishes that are Instagram worthy with brunch served all-day. We love their Signature Cornflake crusted French Toast with Vanilla Bean Sauce (4 Piece Half Portion 1270 yen) and the Benedict which comes with Salmon, sautéed Spinach, grilled Tomato and Dill Hollandaise sauce and your choice of a side salad or potatoes (1550 yen). The presentation beautiful, the food delicious. Stop in and let us know what you think. Business hours: 8:00 – 21:00 daily. I am such a huge breakfast fan! Thanks for the list there are a few here that I haven’t tried. You must add Blu Jam in Daikanyama to the list, they do a great breakfast.